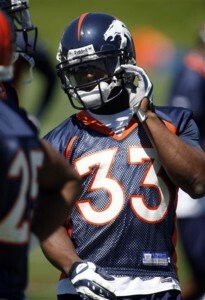 Michael Lombardi of NFL.com reports the Broncos have traded cornerback Alphonso Smith to the Lions. In return for Smith, the Broncos will receive tight end Dan Gronkowski and an 2011 undisclosed draft pick from the Lions. Denver traded a 2010 first-round pick to the Seattle Seahawks to move up to the 37th overall pick of the 2009 NFL Draft to select Smith, who totaled 14 tackles in 15 games as a rookie. Smith was behind cornerbacks Nathan Jones and Perrish Cox, and the Broncos really like the upside and return ability of 2010 seventh-round pick Syd’Quan Thompson, making him expendable this off-season. Dan Gronkowski has the DNA and attitude to be a great TE for the Broncos pending he can get starter mins.